Recycle Bins are large containers that you must have seen outside your home, in parks or streets and are used to store recyclable material. Once it is filled with the material the same is then picked by the local municipal body or local recycling firms to process those and make new products from them. These recycle bins are very large and normally placed at local supermarket store or recycling center. These bins are also separated from inside so that they can contain different types of material in different compartments. For e.g. : You could wish to separate paper, plastic and disposable glasses. Local recycling firms then process this garbage which in turn helps in making the environment clean and reducing the landfills. In order to make sure that more and more people participate in recycling activity local municipal corporations are now encouraging home owners to dispose off their waste products in recycle bins. These bins are provided to the home owners by municipal corporations themselves. These are normally called household bin are most commonly type of bin today. Recycle bins is a great way to start recycling. It has helped enormously in last few decades to process waste products which could otherwise would have ended up in filling up the garbage. Recycling in other way would help in energy conservation, reducing pollution and landfill reduction. Large bins are also placed at major parks, malls and offices so that people throw away the waste products at appropriate places. Offices dispose large quantities of paper everyday while malls dispose off large quantity of disposable glasses and plates everyday. 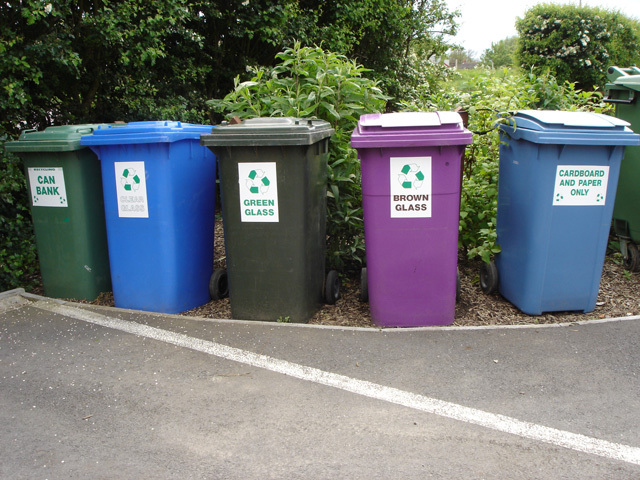 Few countries in the world have proper recycling colors and logos to help people identify the most appropriate bin. This helps people to put proper things in proper places so that recycling firms can easily separate different items from the large quantities of waste products.